When that afternoon fatigue and hunger pang hits me, I need something to recharge myself with. If you are looking for a good, clean source of energy, look no further than to Redd Bar Superfood Energy Bars. Today I am sharing my Redd Bar review with you on the blog for Tried It Out Tuesday. These snack bars are gluten-free, vegan, non-GMO, and contain 35mg of caffeine per bar. These bars will give you the jolt that you need without any jitters. What I love about these snack bars is that they only use pure and natural ingredients in their bar. You will not find anything strange lurking inside these. They also taste fantastic! They come in five different flavors: Chocolate, Salted Caramel (my favorite! ), Peanut Butter, Mint Chocolate, and Oatmeal. Redd Bar is actually 3 items in one handy snack: protein bar + energy shot + multivitamin. It is a convenient snack that is a nutritional powerhouse. I am confident that you will be adding them on the regular for your snack rotation. Keep on reading to find out more about Redd Bar. You will not find any artificial ingredients here. Some of the superfood ingredients you may find in your bar: mangosteen, yerba mate, quinoa, chia, pumpkin seed, acai, schizandra, maca, dark chocolate, goji, and cacao. To find out more about the clean ingredients that Redd Bar uses check it out on their website. The Redd Bar is a great source of protein. As you can see in the photo below (peanut butter flavor), the bar contains 10 grams of protein. This is a great amount of protein for an afternoon snack. The Redd Bar also is a fabulous source of fiber if you need to boost your intake. This bar has 4 grams of fiber. I am always keeping my eye out for tasty gluten-free snacks and the Redd Bar is an absolute winner. With these bars, you will not miss the gluten! Redd Bar really hit the mark with taste and texture. And a big bonus as well is that Redd Bar does not contain any animal products. These bars will be perfect for your vegetarian or vegan lifestyle. If you are looking to gain some vitamins and minerals into your diet, Redd Bar has a vitamin & mineral blend that has pretty much everything you need for your healthy diet and lifestyle. Caffeine in the Redd Bar is equivalent to about a third of a cup of coffee. It is naturally sourced through yerba mate. If you are curious about this superfood you can read more about it on Redd Bar’s website. The superfood maca is also known to increase energy, stamina, and focus. Redd Bar includes maca in your energy bar. You can read more about maca HERE. I have a thing for anything and everything chocolate! This nutrient-dense snack will satisfy your chocolate cravings and in a great way that you can feel good about! This bar has dark chocolate and cocoa powder in it for maximum flavor. Check out these nutrition facts… VITAMINS AND MINERALS GALORE! This particular flavor also has a large amount of dietary fiber… 8 grams! WOWZA! This will really keep your regular if you know what I mean. I am very impressed with these number of the nutrition facts label. This flavor right over here was the first bar that I gave a whirl and boy was I ever impressed with the bold flavor of this particular flavor. This Salted Caramel bar is hands down my favorite. If you love caramel you will be delighted by this flavor. Ahhh yes! Peanut butter!! I am a huge fan of peanut butter and this flavor did not disappoint. The main ingredient in this bar is peanuts. It also has a super grain blend with oats and quinoa. Mint combined with chocolate is a classic flavor that will never go out of style. This bar has a refreshing, bold taste of mint. It is just the right amount too! This oatmeal flavored bar was a terrific flavor. The main ingredients in this oatmeal bar areÂ cashews, oats, and agave syrup. Never fear! The oats are gluten-free! 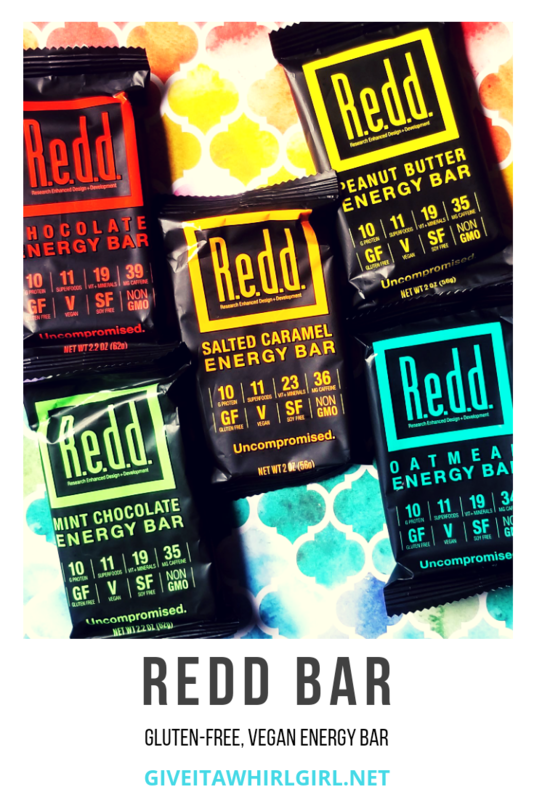 Feeling indecisive and don’t want to commit to just one flavor of Redd Bar? Pick up a variety pack of their five flavors on Amazon. Amazon currently has a $4.00 off clippable coupon for a variety pack of Redd Bars. Don’t miss out on that special offer. Pick up your variety pack on Amazon today! Price per bar is $2.99 at their online store. You can also subscribe to Redd Bar and save 10%. Redd Bar also allows you to create and build your own variety pack. Redd Bar is going to now be a regular part of my healthy snack stash. I am overall very, very pleased with the taste, texture, everything about these gluten-free, vegan bars. The ingredients inside these bars give me both a boost in vitamins and a boost in energy to combat afternoon fatigue. When I eat one of these bars I feel great about the snack choice that I made. I am really happy I found myself a great snack bar that is only made with all-natural ingredients. I also love that these bars have a great amount of fiber in them. Helps keep things going smoothly. I hope you enjoyed this Redd Bar review on my blog and hopefully I inspired you to give a variety pack a try! What flavor of Redd Bar’s energy bars will you be reaching for first? Leave me a comment and let me know. This entry was posted in Product Reviews, Tried It Out Tuesday and tagged bar, caffeine, chocolate, clean eating, cocoa, energy, fiber, gluten free, maca, mint chocolate, nutrients, oatmeal, peanut butter, product review, protein, Redd Bar, review, superfood, Tried It Out Tuesday, vegan, vitamins, yerba mate. Bookmark the permalink. I have never heard of these bars before, but I think they’d be a great thing to throw in my husband’s lunch box – he often works long hours so this would give him a nice energy boost. Thanks for sharing! They are great when you need a little boost. I really loved the Salted Caramel. It was bursting with flavor! !